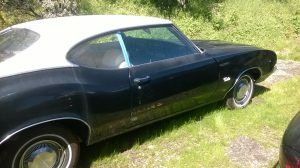 65,454 “regular” Pontiac GTOs were produced in 1969, so even with a generous estimate of 10% survival there are fewer than 7,000 left. This example certainly needs some work, but has already received PHS documentation so you’ll know what you need to do. It’s listed for sale here on eBay where the buy it now is $8,000 and the seller will consider lower offers. Since the Packers aren’t preparing for the Super Bowl this year, all you cheeseheads around Hazelhurst, Wisconsin can go take a look in the garage for us! 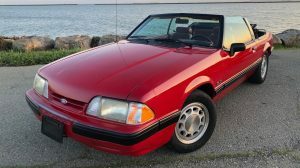 The current owner has only had the car for a year and by their own admission has done nothing to it. As you can see, there will have to be some panel patching or replacement. 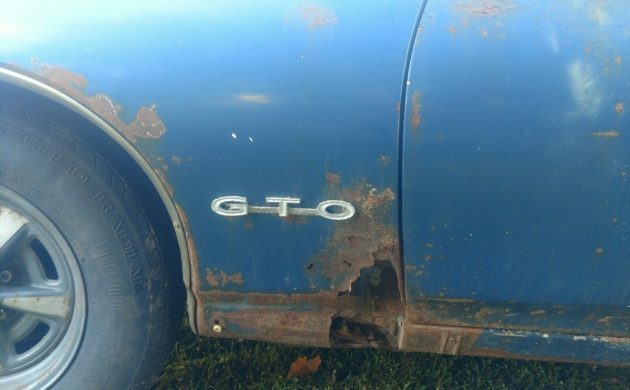 A little bit of checking the VIN showed that the GTO badging is real and that it was produced in Arlington, Texas. Would you save this rear fender or replace it? 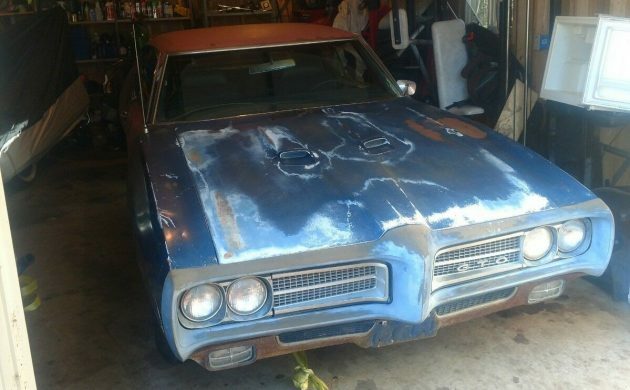 With the automatic and an assumption that the engine below is the “standard” 400 cubic inch V-8, this is actually the most common variant of 1969 GTO produced with 32,744 produced. 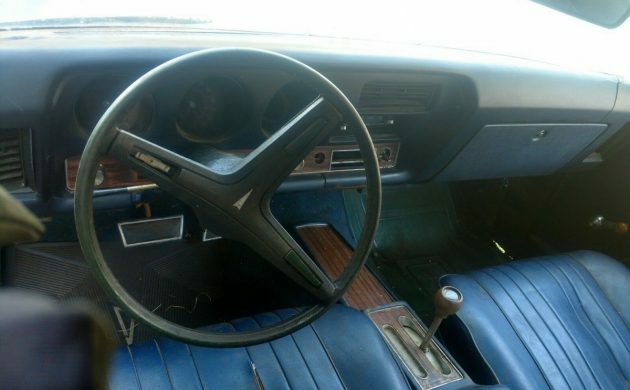 The interior looks pleasingly original but upholstery, dash and console will still have to be restored or replaced. Apart from the radio everything looks intact. 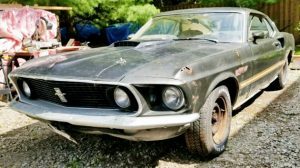 It’s a shame the seller hasn’t even tried to turn the engine over; it would be nice to know if it’s free or not. The title is clear and waiting if you are interested! What do you think about this “Goat”? This car needs a lot of sheet metal work. This car needs a lot sheet metal work. LOL on the Packer comment Jamie, never kick a man unless he is down. Definetly a Wisco car, look at that window washer bag mount. Not only do we have rust to put up with here, we have cold. 25.8 below 0 this morning. Ya, I know you are laughing Howard! And thanks for the link, be going back to that after my fix here at BF. Take care, Mike. I’ve heard THAT before…many times. I remain cautiously optimistic. BTW, I’m surrounded by Packer fans at work despite living in NC! Thats OK Dennis, I have a little cabbage on your team! LOL! Hope it works out for you. 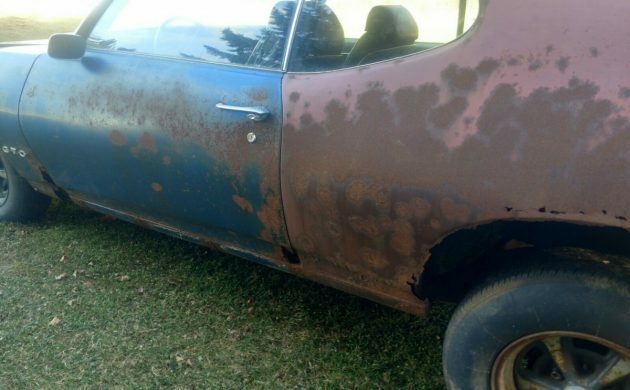 Not only rust and rot,but rodents like old muscle cars too! 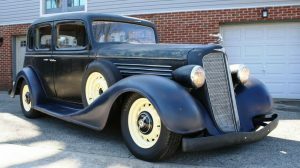 This looks like more of a parts car to me,what a shame,these are cool classics…. things right! Gotta run, dinner’s ready! Hey Ken, that 5 below was last night. Better eat and run, and then take that PT Cruiser out for a spin! Someone commented about being surrounded by Packer fans in North Carolina. 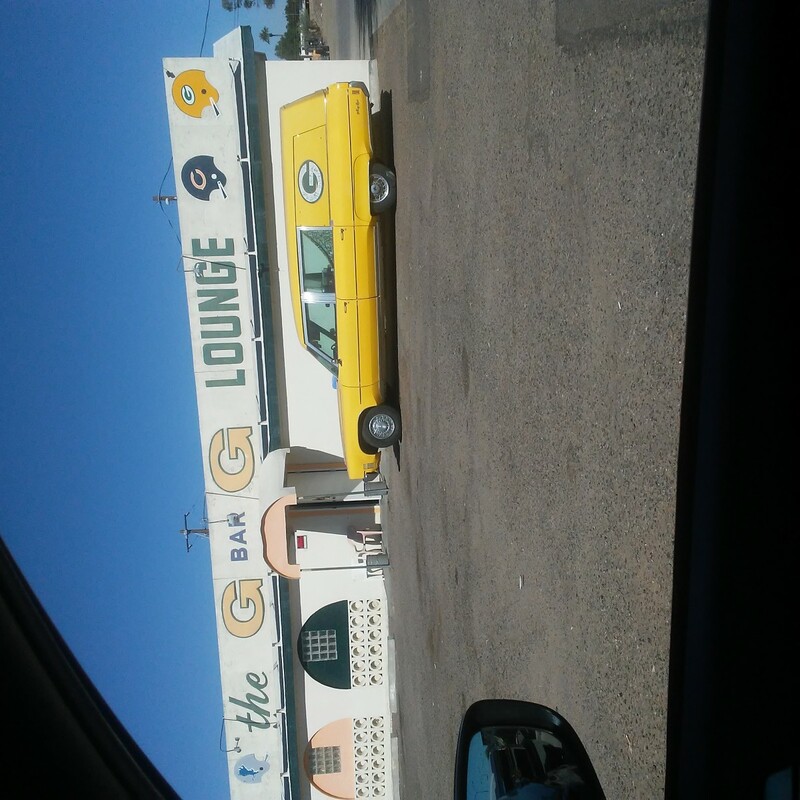 As a Milwaukeean, a season ticket holder & Lambeau field & a hearse lover, I had to take a picture of this tavern I passed in Apache Junction Arizona about a little over a year ago. I should have stopped in for a beer! Why do my pictures keep turning sideways? Because we are Packer and hearse fans Stevie G. Gold package ticket dude myself. You should be sent to a lifetime of sitting at Soldier Field for not stopping. Cool pic just the same Brother. You can beat are Pack, but you can’t lick our Dickey. All this talk about ice cold temperatures makes me long for Phoenix,Az. Where I was born and raised. Rust? Salt? I must say I never once had to shovel out my driveway. Or miss school because of too much snow. I’ll take a 120° day in the summer anytime over subzero temps. Oh as for the Goat? May it rust in peace. don’t make a windshield ground to my. 56° here in sunny Florida! Hey leiniedude, I am a gold package holder too. This August, lets meet @ the tundra for a beer during the preseason game. I assume Leinenkugels might be your brand lol. I can pack some of that for ya! 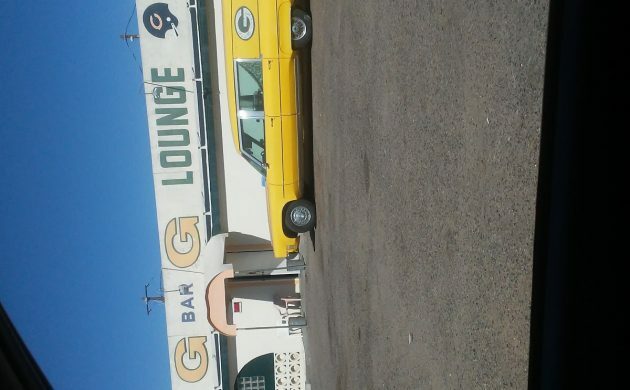 Next time I am down in Arizona I think I might go back to that bar. I know how to find it. I just wish my pictures would stop turning out sideways lol. Sounds like a plan Stevie G. Good guess on the beer of choice! Don’t worry to much about the photos being sideways, I see it a lot here. I can still turn my head enough to view them. If they were upside down, then I would have a problem! Take care, Mike. Whaaat?!!! Did I read that right Mike?!!! call a penalty for that type of celebration. Hi Ken, that saying was a bumper sticker referring to the Packers QB Lynn Dickey, back in the Late 70’s and early 80’s. 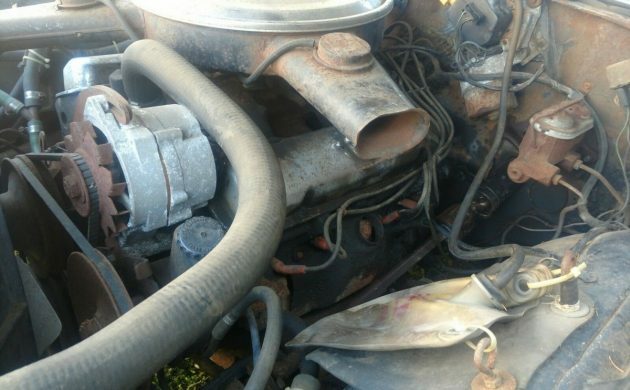 I think when a seller say he havent tryed to turn engine by hand, its becourse its frozen. The first thing i doo when looking at a car for sale is try to turn engine. That and rust, is the first i want to know about. I think seller had to admit, that he have a hopeless car on hand. Damage control. Not even a parts car, if engine is worth nothing. Not even a manuel transmission. Nomatter price il pass. It isnt worth the shipping kost. Imo. I think before this guy got this Goat it was stored in the Edmunds Fitzgerald. Thinking that if a I won enough money in the lottery so that I could afford to toss money at a car while learning how to weld that this car would be perfect. It needs rear quarters, rockers, trunk floor, probably a good part of the floor and wheel houses. It needs front end sheet metal but at least there is no welding there. This car needs a new car.